ABC News reports the suspect in the mail-bomb scare was identified Friday as 56-year-old Cesar Sayoc, of Aventura, Fla.
OPA-LOCKA, Florida -- A Department of Justice spokesperson confirms that one person has been arrested in Florida in connection with the pipe bombs that have been mailed to several prominent Democrats and other critics of President Donald Trump. Law enforcement sources tell ABC News that 56-year-old Cesar Sayoc, of Aventura, Florida, has been taken into custody as a suspect in the suspicious package investigation. He was arrested at an auto parts store in the nearby city of Plantation, and he reportedly has a criminal history and ties to New York City. In a press conference Attorney General Jeff Sessions said the bombing suspect is charged with five crimes, including illegal mailing of explosives. Wray says the suspect arrested was found in part using fingerprint evidence and possible DNA. He said Friday investigators had fingerprints of Florida resident Cesar Sayoc and had possible DNA collected from two explosive devices. Wray says they matched a fingerprint found on one of the packages that had been sent to U.S. Rep. Maxine Waters of California. Law enforcement officers were seen on television examining a white van, its windows covered with an assortment of stickers. The stickers included images of American flags and what appeared to be logos of the Republican National Committee and CNN, though the writing surrounding those images was unclear. 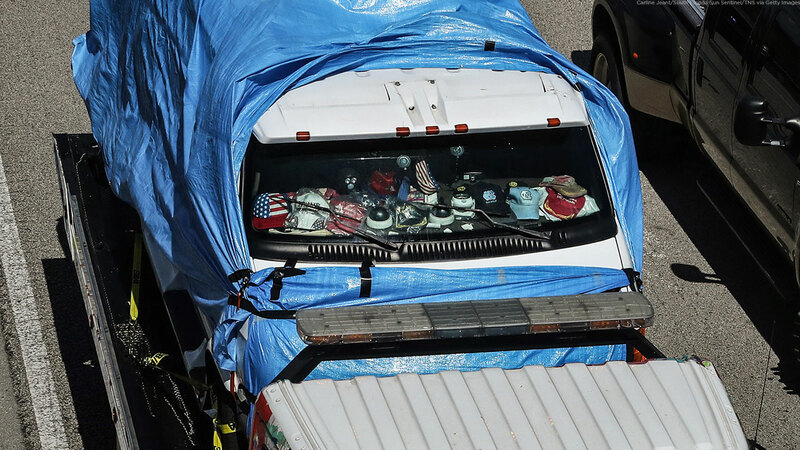 The van believed to be owned by bombing suspect Cesar Sayoc Jr., 56, of Aventura, is transferred to the FBI Headquarter in Miramar, Fla., Friday, Oct. 26, 2018. Authorities covered the vehicle with a blue tarp and took it away on the back of a flatbed truck. Multiple sources tell ABC News that authorities have now recovered 13 packages as part of the widening investigation into suspected bombs. President Donald Trump speaks at an event Friday after a man was taken into custody in Florida in connection with a mail-bomb scare. Sources said the 11th package was recovered at or near Opa-locka, Florida. It was addressed to Sen. Cory Booker of New Jersey. New Jersey Governor Phil Murphy released a statement on Twitter about the package sent to Sen. Booker. Another package, the 12th, was discovered at the 52nd Street post office in Manhattan and was addressed to Former Director of National Intelligence James Clapper. The postal facility in Opa-locka has emerged as a focal point for investigators trying to track down the sender of the suspected mail bombs, law enforcement sources familiar with the investigation told ABC News. It's one of the postal centers the packages may have moved through and the Miami-Dade police bomb squad swept the facility at the request of the FBI as a precautionary measure. Investigators were led to south Florida in part by forensic evidence obtained from the packages and from US Postal Service images of mail that is processed through their facilities. Also Friday, Former Vice President Joe Biden said he would campaign in New York and Connecticut despite a post office in Delaware intercepting two suspicious packages addressed Biden on Thursday. Law enforcement officials also seized three more suspicious packages Thursday and said they were similar to crude suspected pipe bombs sent to George Soros, former President Barack Obama, Hillary Clinton, CNN, Rep. Maxine Waters and former Attorney General Eric Holder. Another was addressed to Robert De Niro, an outspoken Democratic supporter, and sent to a Manhattan address associated with the actor.